TMSA hosts a broad range of educational opportunities involving peer-to-peer learning, best practices, and skill-building. 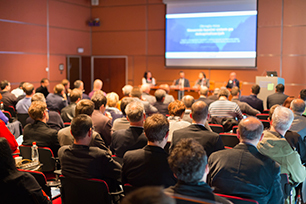 Educational options include attending our Marketing & Sales Leadership Conference & Expo every June, Marketing and Sales Regional Meetings held throughout the year, Connections Events held in major markets, or our Webinar series. As a member, you also can gain insights and knowledge through our blog or from exclusive Members Only access to our online resources. Interested In Sharing Your Knowledge and Expertise? Whether it's presenting at our annual conference, during a webinar, or sharing your perspectives as a "thought leader" on our blog or e-newsletter, there are ample opportunities to participate. Contact TMSA Member Services at 952-466-6270 x208 or click the link below to submit your idea for an educational session. The TMSA Education Committee is seeking qualified subject matter experts who can provide solid educational content and expertise on a relevant topic for these opportunities in 2019. The 2019 TMSA Logistics Marketing & Sales Conference will take place June 9-11 at the Omni Amelia Island Plantation Resort near Jacksonville, Fla. This will have a particular focus on the impact marketing, communications, and sales can have on the customer experience (CX). Submitter's contact information, Presentation Title, Proposed Session Description (no more than 150 words), minimum of three learning objectives for the attendee, and proposed speaker(s).